We are a little behind on the kiddie pop culture, but here at the Lee House, we just got into Toy Story. It all started with Miller's potty training. The pull-ups I got Miller were Toy Story pull-ups. 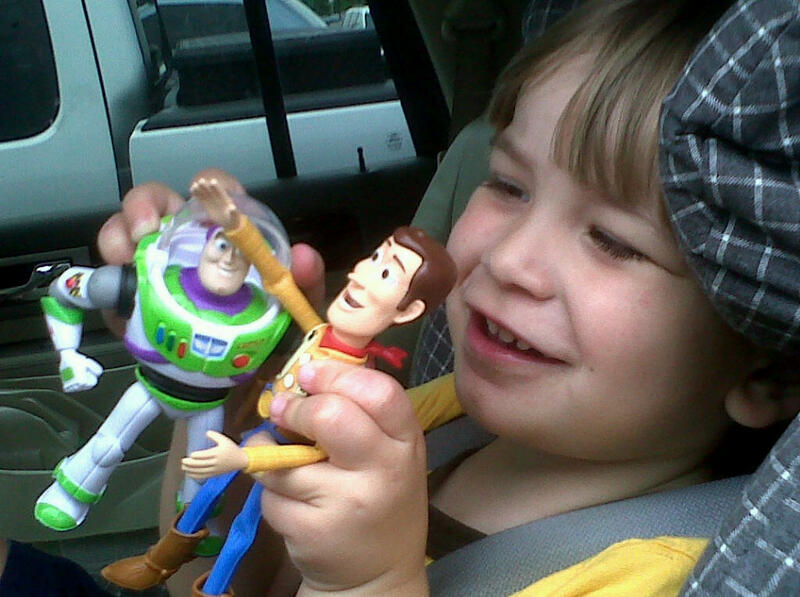 He immediately started saying everything Toy Story was his "favorite." While we were at the lake, I decided to get Miller and Ella Toy Story so that he could actually know what "his favorite" is. Well, of course they loved it! What is not to love, the cutest movie! Thursday Murray took Ella and Sara Wells to the lake and Miller and I had the evening together. 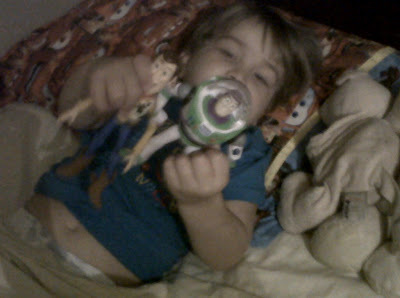 We went to Target and he picked out his own Woody and Buzz. 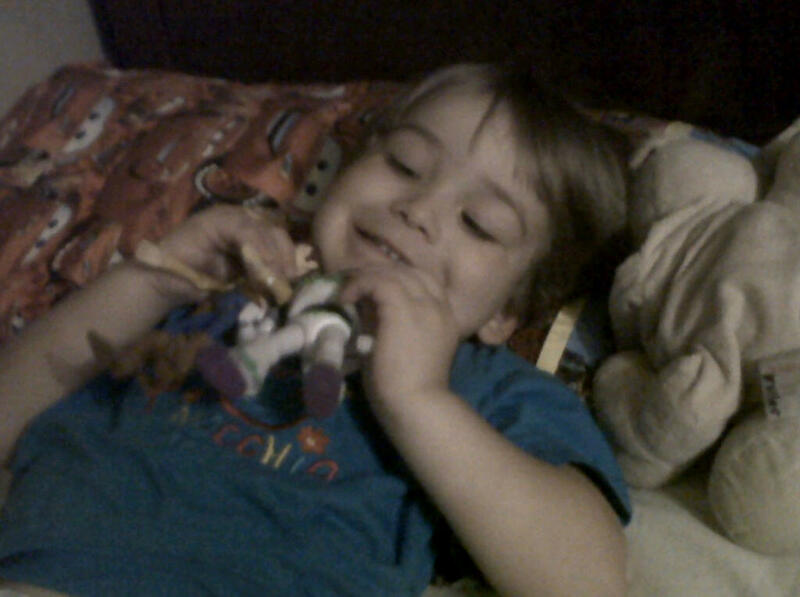 I cannot even begin to explain how much he loves his Woody and Buzz. Here are a few pictures of their first night together. 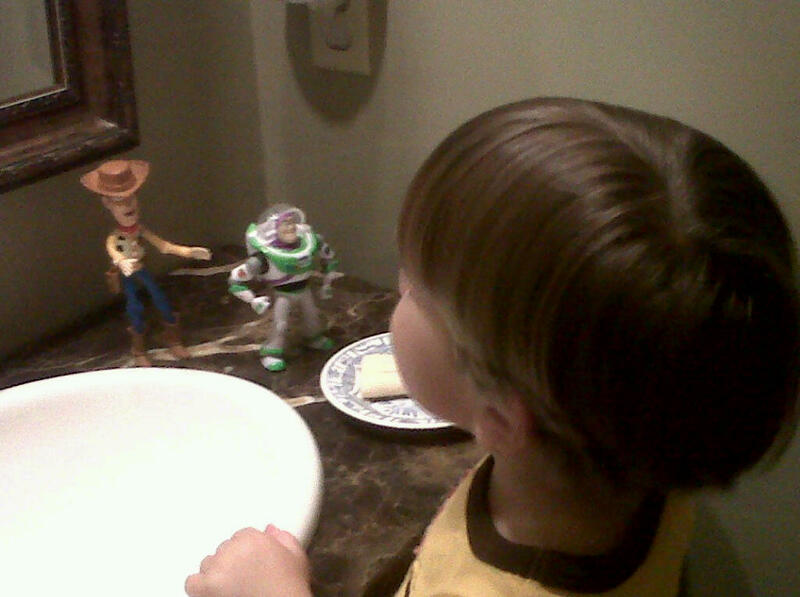 Miller set Woody and Buzz up to watch him brush his teeth. Miller has two stuffed animals that rarely ever leave his side, a pig and a lion. Miller is totally attached to his "Kiggy" and "Ion". I don't know if you all have been formally introduced to Miller's best friends. This is Miller's comfort stance. Miller goes to sleep sucking his thumb and smelling Kiggy's tail. A sign of Miller's affection is begin allowied to smell Kiggy's tale. The tale also has magical healing powers. Any time Miller has a booboo, he rubs Kiggy's tail on it (after it is cleaned and bandaged) and the pain is soothed. It is really the sweetest thing to watch. I am sitting at the dinning room table and I have just wasted about 30 minutes blog hopping. The time I get during nap time is very precious to me (probably too precious). I usually try to be very productive. This is usually when I try to get any projects done that I do not need little hands getting involved in. Today when everyone finally got settled down I pulled out my bible study materials to try to make some significant headway while the kids were asleep and things were still fresh on my mind. I opened up my computer and instantly got distracted and before I knew it 30 minutes had flown by. As soon as I used all of my self-discipline to close the internet and open up what I was working on Miller started talking. My immediate thought was frustration, "Why is he already awake? Now I cannot work on bible study." Then I put it in perspective and realized ok, I am the one who just wasted 30 minutes, it is my fault that I lost my window of opportunity not his. As I am trying to remind myself that it is my fault, not his, I start to pay attention to what Miller is saying. In his sweet little voice he is in his bed saying, "Ion, where are you? Where are you. Ion, Ion, where are you." It made me stop and laugh and realize what precious time I have with these wonderful kids! I know that it is good for me to have a break and to have some things of my own that I do, but at the same time I think I can cling too tightly to "my time" and get very defensive of the kids interrupting what I think is mine. These years go by too quickly. Sometimes I just need little wake up calls reminding of that so that I can enjoy them as much as possible while they are still young and love being home. Before long they are going to be so busy that I will be longing for those few minutes in the afternoon when it was just us. Sara Wells is now taking a big girl bath. Today in my "few precious minutes" with just Sara Wells, we enjoyed bath time. Just a few pictures from our weekend. Nothing spectacular, just everyday happenings at the Lee House. It is easy for me to get caught up in laundry, making lunches, constantly picking up, dealing with whining and forget to enjoy the everyday little things with my kids. Sometimes I have to step back and realize how delightful these everyday things of life are. Picnic in the kitchen. Now that Sara Wells is sitting up, she is becoming more and more a part of Ella and Miller's life. I plopped Sara Wells down in the kitchen to get something done. She was not thrilled at being put down (big surprise), so sweet Ella and Miller brought their snack into the kitchen to eat with her. Usually my complaint is that Ella and Miller do not play with toys. It is still true for Ella. But Miller has definitely started to play with his toys a lot more. The only thing is he does not seem content to play with just one toy. He literally pulls out every one. Here are two pictures of Miller's "playing." At least he is finally playing with his toys! The Mark Lee clan got together for dinner Saturday night, which of course meant our new cousins! We have discovered the biggest form of torture for Ella. Stephen arrived at our house with Chloe and Fitz a few minutes before Wellon. It was time for the babies to eat, but they were happy so Stephen did not want to get them out of their car seats for fear of what that might do to their mood. Well, Ella was not to thrilled with that decision. She sat on the floor letting Uncle Stephen know every time either baby looked like they might be thinking about crying. The quote of the night was, "Uncle Stephen Chloe really looks like she is about to cry. I think she really needs her cousin!" Luckily Wellon was only about 5 minutes behind. I think those were the longest 5 minutes of Ella's life! It has been so fun to watch Sara Wells grow and start interacting with us. This weekend she loved sitting with Chloe! I think this was the first time she has interacted with Chloe and Fitz. As hard as I tried, I could not get a picture capturing her full excitement. At one point she held Chloe's hand with the biggest grin on her face. So sweet! Miller has got the sweetest heart and loves his sisters. Today when Miller woke up from his nap Sara Wells was happily playing with one of his toys. Miller has not been too sure how he feels about Sara Wells playing with his things. But this afternoon he was so sweet with her, even showing her how it worked. Notice Sara Wells' runny nose. Ooops, that did not last too long. Miller totally lost it when he got Sara Wells' runny nose on his arm. A new fruit is in season and we are back at the jelly making! Saturday we all went out to the farm to pick blueberries! Sadly I forgot my camera, but don't worry, there are lots of blueberries left to be picked so there will be a few more chances for me to snap some pics. I have thought about taking the kids blueberry picking, but all the blueberry farms (i don't really know what they are called) are about an hour away and it is so hot that I knew it would not be worth it. Then a couple of weeks ago I found out that the farm has blueberry bushes! All this time and I never knew! I am definitely glad we did not make the hour drive to pick blueberries because the kids only lasted about 30 minutes, but we had a blast. Let's be honest, it was really Murray and me picking the blueberries, but Ella and Miller loved holding the buckets and dumping the blueberries from one bucket to the other. So, what do you do with all these blueberries? Ella has grown to love making jelly! She was the official blueberry crusher today. Sara Wells can now hold her bottle. Growing so fast! Makes me so sad, our little baby is growing faster than seems possible. Sara Wells loves sitting in this chair with Murray and drinking her bottle. This is their little spot. Our little Ella has become quite the photographer. When Murray got home from work today Murray grabbed the camera to take a picture of him eating this banana. Very artistic! A couple of months ago I tried a recipe for Pesto Potatoes and Peas. Of course while I was cooking Ella and Miller were running around in and out of my legs, screaming and chasing each other. During the chaos I forgot about the potatoes and let them roast too long. The recipe called for tossing the roasted potatoes with pesto and sweet peas. But my potatoes were so cooked, tossing was not an option. So what do you do with overcooked potatoes? Make mashed potatoes of course! This ended up being one of our favorite recipes. (I do not even begin to claim that I am good at taking pictures of food, but when it deals with recipes I always like to have a picture to know what my end product will look like. I promise it is way better than the picture makes it look). Toss the potatoes in salt and pepper and olive oil to coat. Roast in oven at 400 degrees until very golden (probably between 40 minutes to an hour). Roughly smash the potatoes, I like them to still be pretty chunky in this dish. Add peas, pesto, parmesan, 1/2 & 1/2 and salt and pepper. You do not need to add very much 1/2 & 1/2, just enough to make it moist. Probably about 1/2 cup of parmesan, but it is really up to you how much cheese you want. I always go by the rule that it is pretty hard to have too much parmesan! Be sure to taste because you may want to add more pesto. Cover with a parmesan and bake for about 5 to 10 more minutes. Enjoy!!! One thing that has really taken off in our garden is our Basil! I definitely want to try to use everything in our garden. One of the best ways to use a lot of basil is to make Pesto! I love pesto and cannot believe that I made pesto from OUR garden! It was definitely a family effort. Miller picked all the basil for us. Ella loved putting all the ingredients in the food processor and "pulsing" the ingredients. I love cooking with Ella and Miller, but it is very different. Something that should take about 5 minutes stretches into 30 minutes. And something that should be relatively easy, little mess ends up looking like a bomb went off in the kitchen. My gut reaction is just to do it by myself where it will be quick, easy and little mess. But, oh how much I would be missing! Not only do I hope Ella and Miller develop a love for cooking, but I also cherish all these memories! All the messes are definitely worth it! Here is what the kitchen looked like after making a simple pesto. The final product. Cannot wait for all the yummy dishes to make with this! Pulse the basil and nuts in the food process until finely chopped (if using walnuts and they are not chopped, pulse the nuts a few time before adding basil so the nuts are chopped small). Add garlic and pulse a few more times. Slowly add olive oil in a steady stream while food processor is mixing ingredients. You will probably have to scrape down the sides a few times. After mixed well, add parmesan and pulse a few more times. Season with salt and pepper. And there you go! Delicious!!! Hard to believe, Sara Wells is already 6 months old! Time flies! Oh what a sweet baby Sara Wells is. She is so happy and so laid back. Sara Wells absolutely loves her brother and sister. Where ever they are, she wants to be there and twists her neck to watch their every move. Sara Wells is almost sitting up on her own. I know within the next couples she will be a pro at it. It makes me so sad that she is going through these stages so fast, but I am also so excited to see what is coming next. Every day we meet a little bit more of her personality. I cannot even imagine what our world is going to be like when Sara Wells starts moving and disrupting Ella and Miller's world a little bit more. One thing that the Lee children love is TV. I think Ella and Miller would watch TV all day long if I let them. Sara Wells is seeming like she is going to fit right in with her brother and sister. We made it back to the lake! We headed back to the lake Saturday afternoon to make it back just in time for our magnificent Frito Misto night. The weekend was filled with family, fun and food (lots and lots of food). Stephen and Alex were the "fry masters" of the night. Have you ever seen so much food??? Uncle Murray's first time to hold both babies. Of course Ella did not let that last long. She could not handle somebody else holding the babies without her! Ella's cousins are teaching her young how to be a cheerleader. I just love the way Miller is looking at Ella in this picture. So sweet! He just loves his Ella!